This morning we decided to make a run for it. 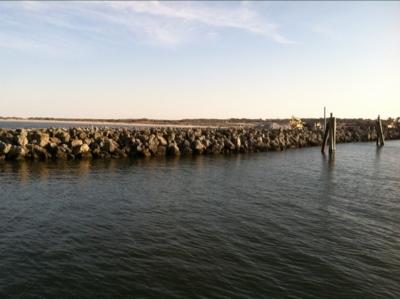 Leave at 6 AM, ride 35 miles to Hatteras for the 9:30 AM ferry to Orcracoke, ride another 14 miles, take the 1 PM ferry to Cedar Island, and ride 40 miles from there to Beaufort, NC, to stay with Nancy’s generous Duke friend Patti. 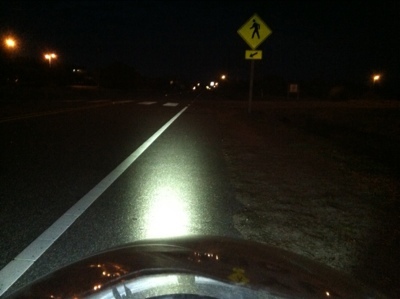 Our headlight cut the darkness. The road was almost empty. We hit smooth pavement, there was a slight breeze from the north, and we cruised at 15-18 mph. The sun rose, the road turned, the pavement got rough, we had a headwind, and our speed dropped to 10-13 mph. 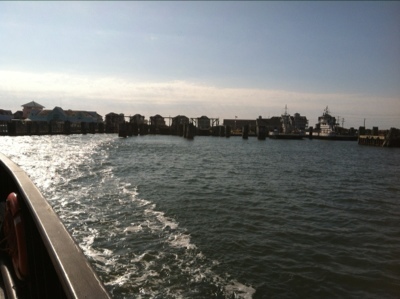 Still, we made the 35-mile run to the Hatteras ferry in plenty of time. While we waited to depart, Jeffrey talked to Judy, a ferry worker originally from near Pittsburgh, PA, who loves NYC. (In contrast, some locals have told Jeffrey that he “must be happy to be out of there.”) She takes cheap buses from Virgina Beach to Manhattan whenever she can. They talked about the asylum system and human rights issues. She will follow us to Florida on-line. 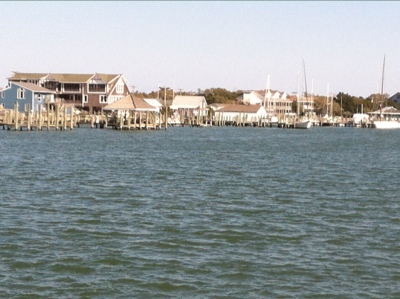 We departed for Ocracoke Island. Aboard the ferry, Jeffrey talked to a couple from Waxhaw, NC, who have worked all over the world on humanitarian and missionary projects, and whose current work involves translating the New Testament into obscure but still-spoken languages. She is a former hospice nurse who helps vaccinate missionaries headed overseas, he is a mechanic, one of their children-in-law is a Bolivian, another teaches and studies languages at a Christian college. They had tales to tell from their travels. Jeffrey told them how our country’s asylum system betrays our professed values. They told a related story of a visit to a rural Tennessee church, where the pastor preached a message contrary to the Christian doctrine of love and inclusion. Educated and ethical people like them, when alerted to these wrongs, can be the sunshine that disinfects. 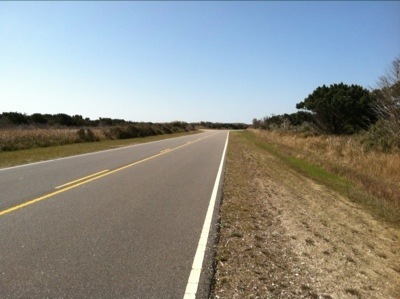 This part of Ocracoke had no paved shoulder, but with so little traffic, who needs one? 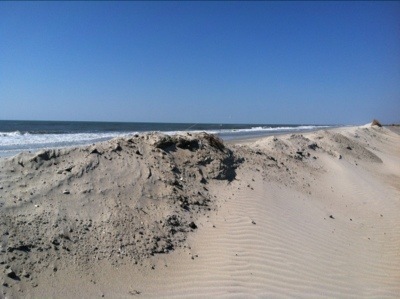 Then vegetation became more sparse, and sand more plentiful. Then came the sand, and more sand, in dunes between the sea and the road. 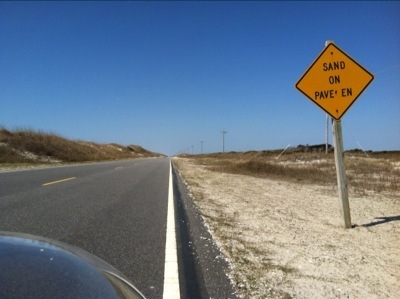 We were told that sand frequently covers the road and must be pushed back with big machines. Then we came to another vegetated area. A Canadian couple, serious amateur cyclists, had come from Ottawa to the Outer Banks to train. The man, a government consultant, rode alongside Jeffrey for a while to talk about cycling, racing, refugees and asylum. His wife got about 1/4 mile ahead of us. Jeffrey asked if he could catch her. 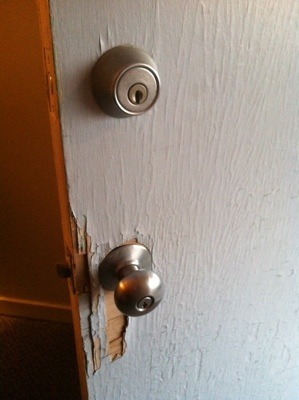 “No problem,” he said. And he zoomed away from us as if we were standing still. We saw in the distance that he did catch up with her in a very few minutes. He was very fast. We claim only to be persistent. 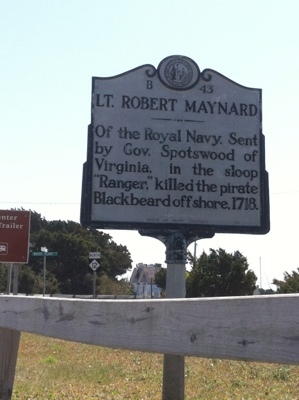 The title of a recent post referred to Blackbeard country. 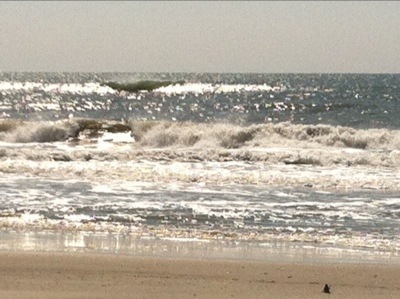 Here is where Blackbeard’s story ended. 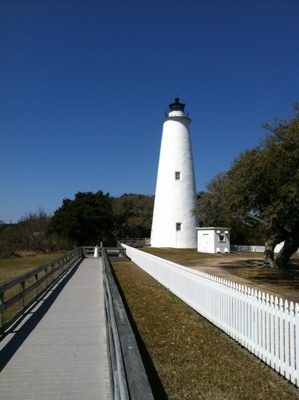 This is the Ocracoke Inlet Lighthouse, built in 1823. We passed the more famous Hatteras lighthouse this morning – saw it from a distance – but when we got to Hatteras, we couldn’t spot it and didn’t want to miss the ferry to Cedar Island, so we have no photo. The 1 PM ferry was canceled. Engine trouble. So we took the 4 PM ferry. The delay would force us to spend 3 or even 4 dark hours en route to Beaufort. So we’ll spend the night in Cedar Island instead. The hotel is a dump. But we’ve seen worse. 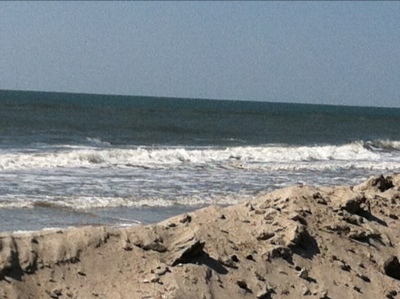 Goodbye to Ocracoke and the Outer Banks! On this ferry, we had a great, wide-ranging conversation about cycle touring, medicine, human rights, you name it, with Zach, an operating room pharmacy technician who dabbles in construction, and who plans to move to Denver. He believes in human rights and says he’ll follow the Ride. He offered to take us to Beaufort in his truck. (Jeffrey declined. We go under our own power when we can.) A real gentleman and philosopher. 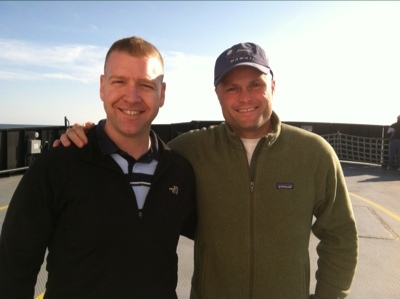 Ryan and Jim are Marine Harrier pilots who were fascinated by the Sprint 26. Of course, Jeffrey got to talking about asylum and Human Rights First. Jim was surprised to hear that thousands of persecuted people seek refuge in the U.S. every year. His reaction shows that the numbers truly are small – how big a splash would even 50,000 people (1000 per state) make? Both officers formerly were based in Arizona and told Jeffrey about balancing work and family, the role of the Harrier in Afghanistan, drones, drug smuggler ingenuity, how foreign farm workers are harmless, and more. These thoughtful professionals seem to have no problem with America being more generous to newcomers, whether refugees or people who simply want to work to support themselves and their families. 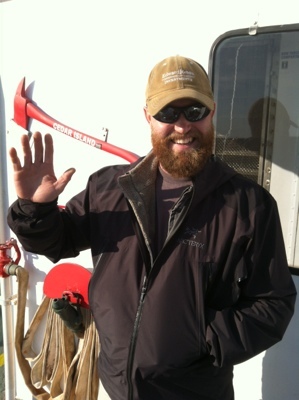 A Coast Guardsman approached Jeffrey on board. He said, I drive back and forth on these islands, and I saw you several times yesterday. After Jeffrey told the man about HRF’s volunteer lawyer program and its efforts to stop persecutors by depriving them of resources, he said, I admire what you are doing. And he asked whether Jeffrey had heard of a dual Iranian-American citizen who returned to Iran to open an orphanage, was accused by the Iranian regime of proselytizing, and imprisoned. Jeffrey had not heard of this case, but told the Coast Guardsman that the Iranian government even murders those (like the Baha’i) who do not conform. Like the couple from Waxhaw, the man kindly gave Jeffrey his blessing. After 2-1/2 hours on Pimlico Sound, we landed at Cedar Island. The area is desolate except for shuttered seasonal businesses and the seedy Driftwood motel (see the door below – we’ll spare you the rest of the room). 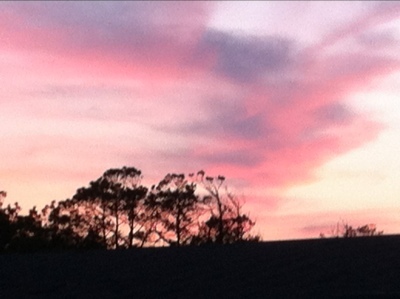 Yet that can’t take away from the North Carolina sunset! 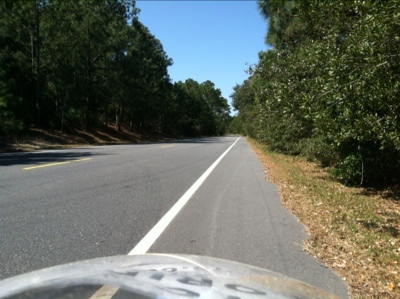 This entry was posted in Asylum, Bicycle Touring, Ethics, Human Rights, Immigration, Outer Banks, Tricycle touring by Joey. Bookmark the permalink. at least the weather is keeping its promise. word of caution: can’t spread the word of love and kindness in tandem with hate words towards others and self exceptionalism, no matter how bad ‘the other’ is or ‘how good’ we are. hope you have a good even if seedy night. sorry! You misunderstand, which means we have not been clear. Our message is not love. It is adherence to what most of us SAY we believe about the treatment of strangers (especially but not only refugees). Regardless of whether our lodestar is the Bible, Quran or Torah, the American flag and the Declaration, the free market or any number of secular philosophies – our leaders violate those principles in our name. The few people we described last night included Christians, the secular, civilians, military personnel, people in their 20s and 30s and 60s. There have been many, many more, including someone who recalls you from OWS! So you see, Jeffrey and I are NOT exceptional. When presented with the issues in the context of their beliefs, the people we meet support HRF’s values just like we do. No one we’ve met has argued with that idea. In our country, the People are sovereign. The law is meant to reflect our will, subject to protection of minority rights. Our message is never of hate, but of principle. It is that the true will of the People is being frustrated by the cruelties done or tolerated in their name. And that when the People realize this, they don’t like it. Our night was OK, thank you. Jeffrey got used to the smell, mostly. I can’t smell so I had no problem.